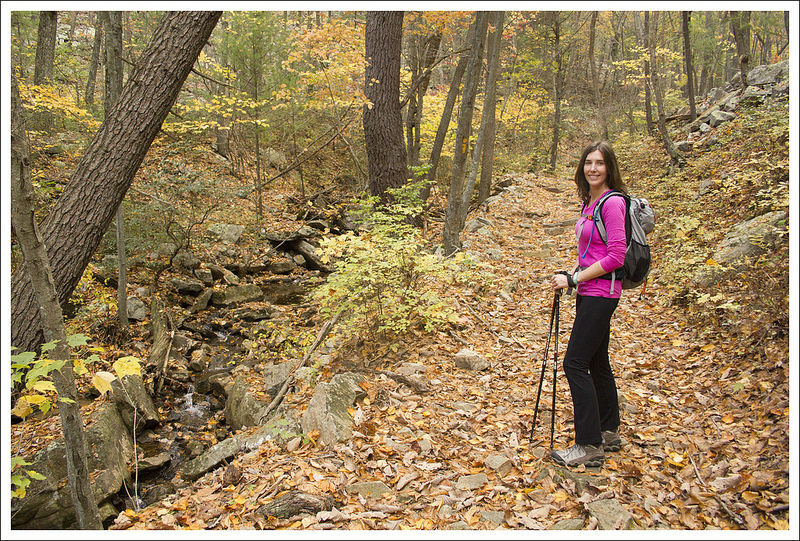 This hike is easy for a 7-miler! Gentle grades along an old roadbed take you to a lovely view of the Shenandoah River and mountains beyond! The Point overlook on the Veach Gap hike offers nice views of the bends of the Shenandoah River and the mountains of the national park beyond. 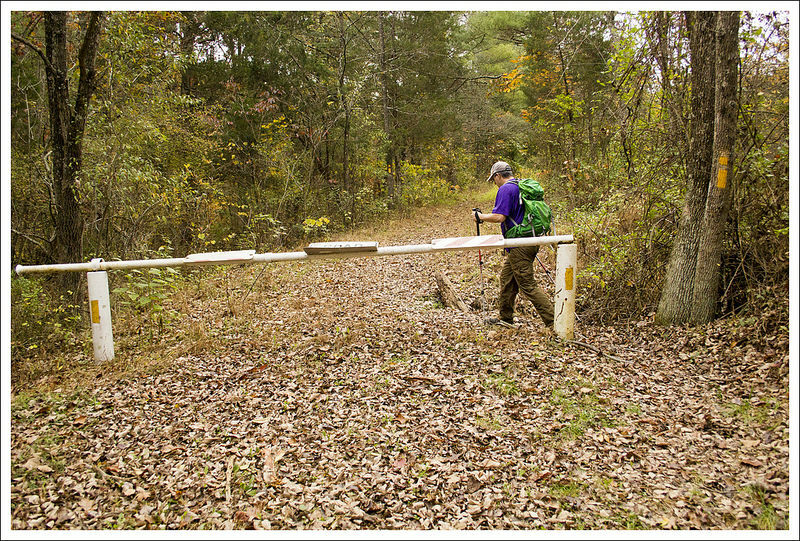 Below: Adam crosses the closed gate at the beginning of the trail; Christine hikes the Veach Gap trail; The main trail junction on this hike. Throughout fall 2014, our employer (and alma mater), James Madison University, participated in the Outdoor Nation Campus Challenge. Basically, students and employees accrued points for outdoor activities. The school that compiled the most points in the end won a prize of cash and outdoor gear. 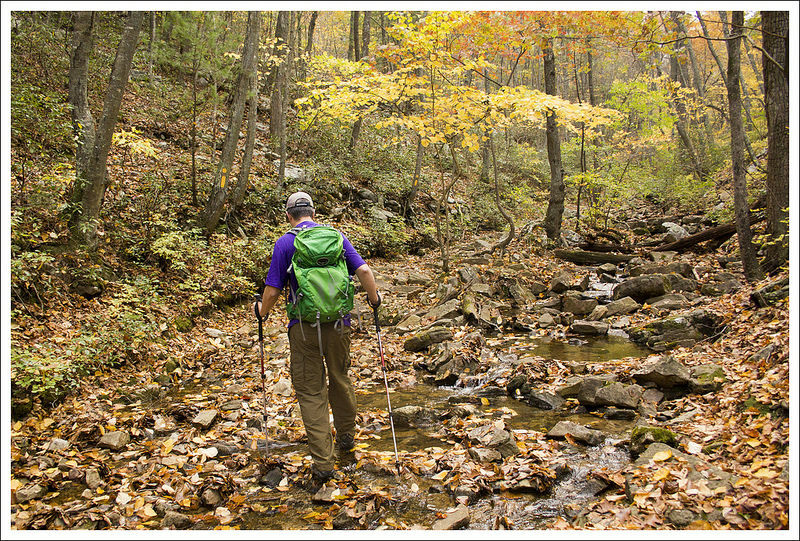 One component of the competition was completing a collection of eight local hikes. The list included many hikes we had already done (Old Rag, Humpback Rock, Fridley Gap, High Knob Fire Tower). Veach Gap was one of the only hikes on the list we hadn’t done, so we decided to check it out. From the end of Veach Gap Rd. in Fort Valley, the hike begins along the Veach Gap Trail (blazed in gold), which is an old road bed. Supposedly, this trail is what remains of the historical Morgan’s Road. General George Washington requisitioned the road during the Revolutionary War. It was built to be used as a path of retreat from Yorktown. As we all know from history, the war went America’s way, and the retreat route was never needed. The road was still used locally for many years before falling into disuse and transitioning into a trail. At one mile in, the Veach Gap trail crosses Mill Run. This is really the only potentially confusing spot to navigate on the hike. The trail crosses at a diagonal, so look carefully for the gold blazes on a tree slightly upstream. Shortly after crossing the stream, you may notice a rock formation in the shape of an upside down ‘U’. This is called an anticline, and it’s a very unusual geological feature in our area. I’m kind of ashamed to admit this, but we didn’t even stop to look at the anticline. I forgot it was there, and my mind was more focused on fall colors, lofty views, and potential wildlife sightings. But, if you’re a geology buff – don’t miss this feature! Crossing Mill Run. You can see the blaze on the tree on the opposite bank. 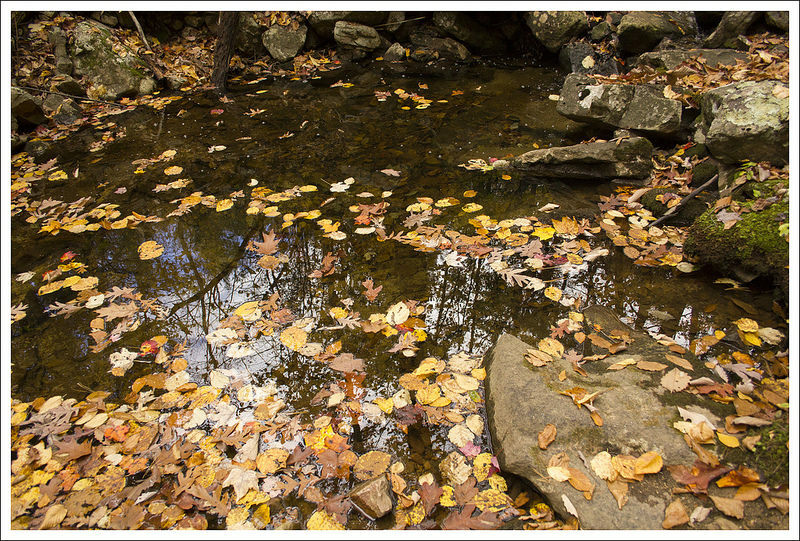 Below: Pretty fall leaves on the water; Blazes for Veach Gap, Tuscarora, and the Massanutten Trails; After the main trail junction, the Massanutten Trail became a little steeper and rockier. 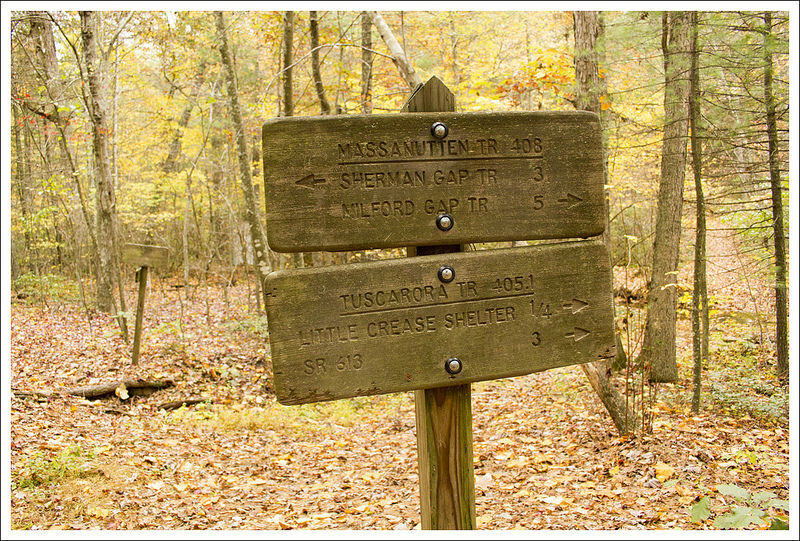 A short distance after crossing the stream, the Veach Gap trail merges and becomes jointly blazed with the orange-blazed Massanutten Trail and the blue-blazed Tuscarora Trail. The three trails share the route for (at most) a couple tenths of a mile. AT 1.2 miles, you’ll come to another trail sign. To the right, the trail heads in the direction of the Little Crease Shelter. 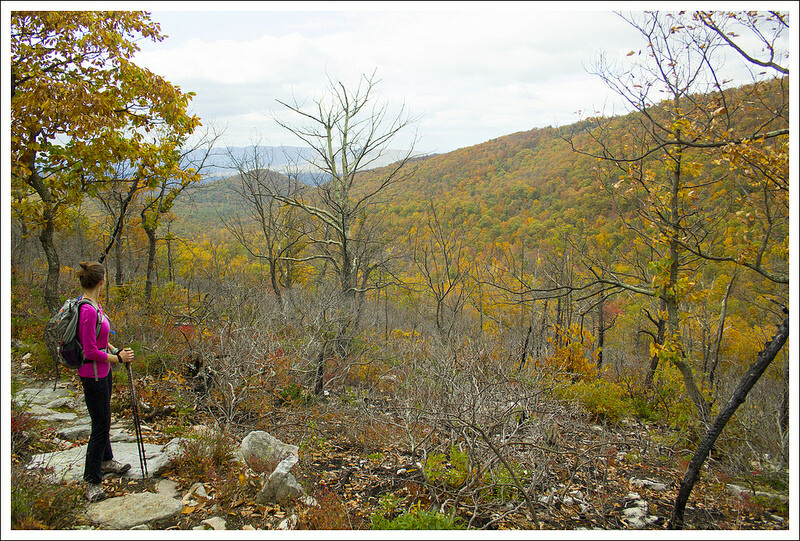 Stay to the left (blazed orange and blue), headed up Little Crease Mountain and toward Sherman Gap. About a half mile after this intersection, you’ll pass a marked group campsite on the right. Continue meandering uphill along a gentle grade. At three miles, the trail becomes a bit steeper with switchbacks. There was a significant forest fire here in 2012, so the canopy is thin and allows nice views along the climb. We saw lots of charred stumps and blueberry bushes along the increasingly rocky trail. Eventually, the trail leveled out along the ridge. 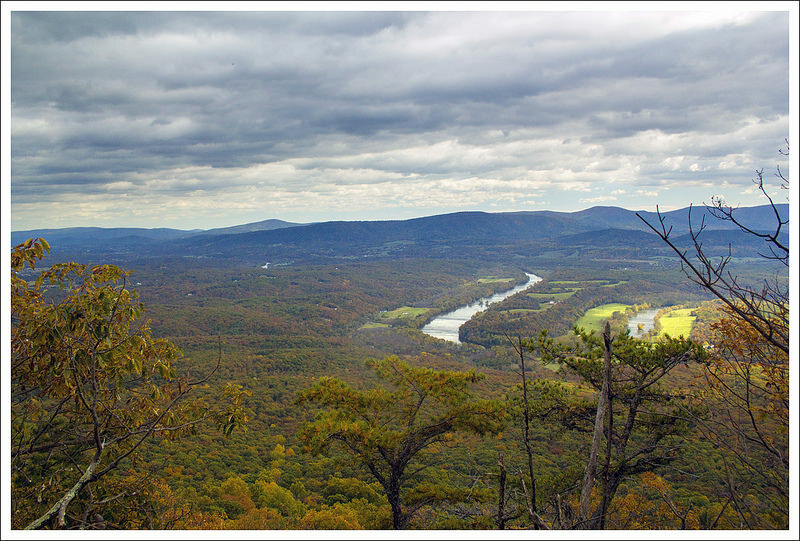 We soon reached The Point Overlook – a small outcropping of rocks overlooking a sweeping bend on the Shenandoah River. We had a snack, took a few photos, and spent some time chatting with a fellow hiker (Hi, DJ!) before heading back down the way we came. 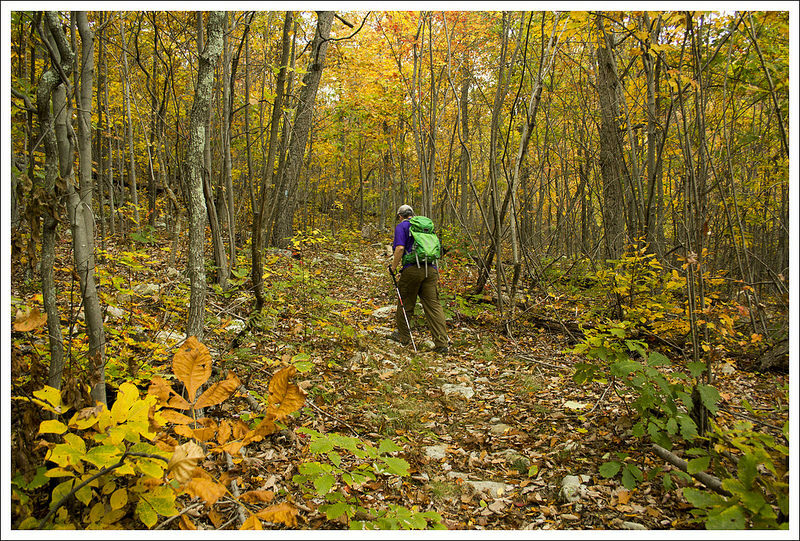 Veach Gap was really a lovely hike to enjoy at the peak of fall foliage season. After getting back to our car, we made the short drive into Front Royal so we could enjoy burgers and shakes at Spelunkers. Great day! 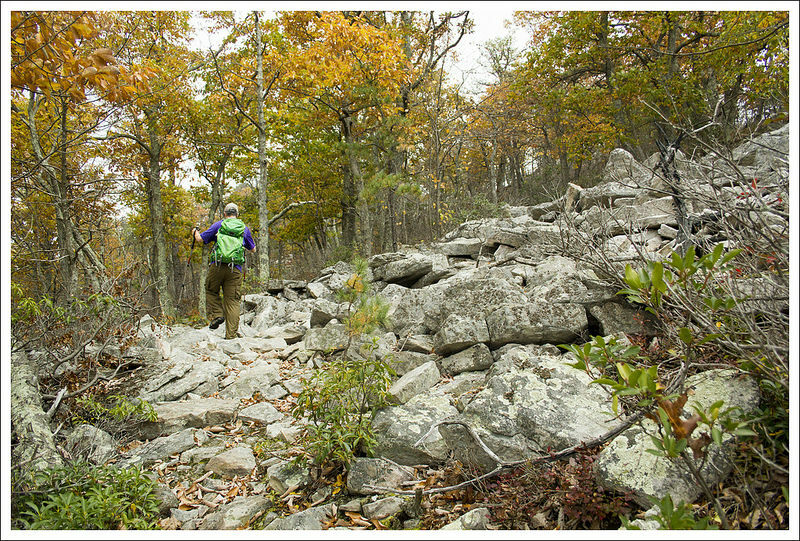 When we were reviewing the peakbagging hikes that were listed for JMU students/faculty to try for the Outdoor Nation competition, we were surprised to see this one on there. My guess is the coordinators looked up hikes that were close to Harrisonburg without thinking of what would be seen on the hike. We initially thought this wouldn’t be that nice of a hike, since we hadn’t heard anyone mention it before to us, but the views made this a pleasant surprise. When we pulled up to the parking lot, we saw a few cars already in the parking lot and a group getting ready to hit the trail when we did. Of course, we saw vehicles for hunters, so we were a little worried about how this trail was being used overall. We were glad that we had brighter clothes on, which is always a precaution to consider during hunting season. We started off on the gold-blazed Veach Gap trail by crossing through the gate and walking on the fire road. The trail was very flat and passed through some younger forest. We were greeted with sights and sounds of Mill Run to the left of the trail. The higher we hiked, the more views we got through the trees. Below: Adam takes in the view; The ridge was burned by a forest fire in 2012. The damage is still fresh and evident; Adam descends. We soon came across two bow hunters, that seemed to be milling around, more about enjoying the outdoors than they were about hunting. At .35 miles, the fire road turns into trail. 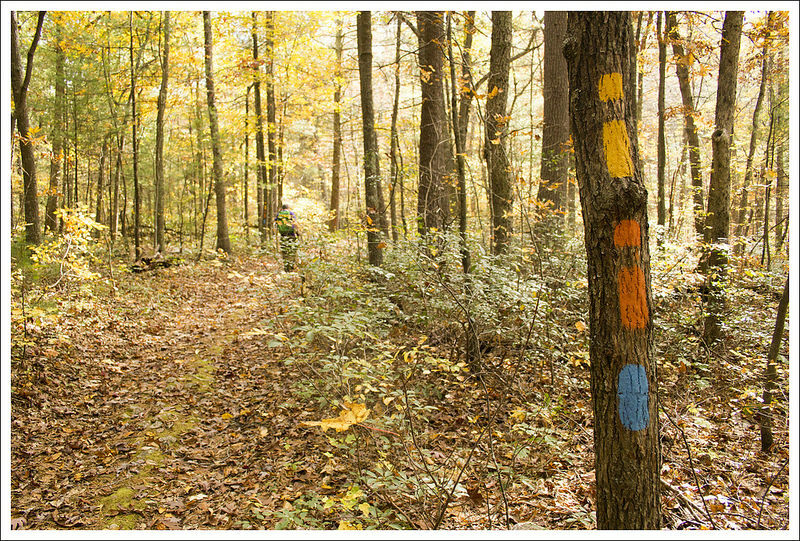 At 1.2 miles, take a left at the junction and join the blue and orange-blazed Massanutten Trail. The trail continued a slow, gradual climb heading northeast. At 3.0 miles, the trail takes a sharp, southern route and at 3.2 miles, it switches back to the normal northeastern direction. On our climb up, we passed by a large group of boy scouts that were covering some miles over the weekend, but were looking to camp near the crossing at Mill Run. The slightly-obstructed views of the mountains beside us were so colorful in this peak fall setting. As you climb up to the ridge, you start seeing a lot of the forest fire damage. Since this happened in 2012, you start seeing some of the plants starting to grow in place of those that burned. We reached the ridge and followed it for about .15 miles. At 3.5 miles, we found a pile of rocks marking a short climb to the overlook where we stopped. 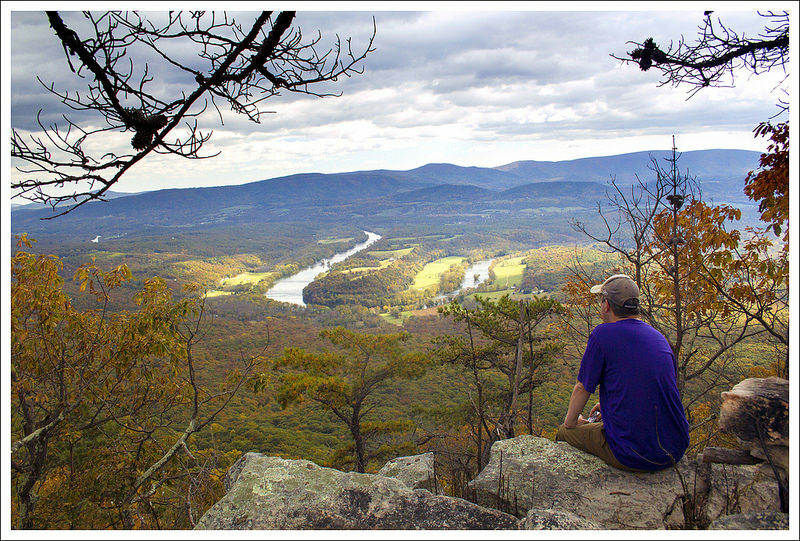 The true highlight of the view is seeing the bends of the Shenandoah River from this rocky perch. There wasn’t a ton of room at the top that was unobstructed, but it was enough for a few people to take in the view. If you feel like you would like a view hike with a good amount of solitude, this may be a great selection. Elevation Change – 1100 ft. Difficulty – 2. This is an easy hike to a nice viewpoint. Trail Conditions – 4. The trail was in great shape in most places. Dry, fallen leaves made some of the descents slippery. Views – 3.5. The view of the bends of the Shenandoah River is nice, but slightly obstructed. Streams/Waterfalls – 2. The stream along the early part of the trail is really pretty. Wildlife – 2. We didn’t see anything but a few birds and squirrels. Ease to Navigate – 3. There are a few junctions and a few unmarked trails that cross the route, but you should be fine if you follow the blazes. Solitude –4. We did see a troop of Boy Scouts and a handful of others hiking in this area on a perfect fall weekend near peak foliage color, but generally this area is very quiet. Directions to trailhead: From Luray, VA, take SR 675/Camp Roosevelt Road. Go .8 miles and take a left to stay on SR 675. In 2.2 miles, take a right to stay on SR 675. In 7.8 miles, take a right on to SR 678/Fort Valley Road. Follow this for 9.7 miles and then take a right onto SR 774/Veach Gap Road. Follow this about .75 miles to the end of the road, where you arrive at a parking area. The trail starts after you walk around the gate. Hi!! 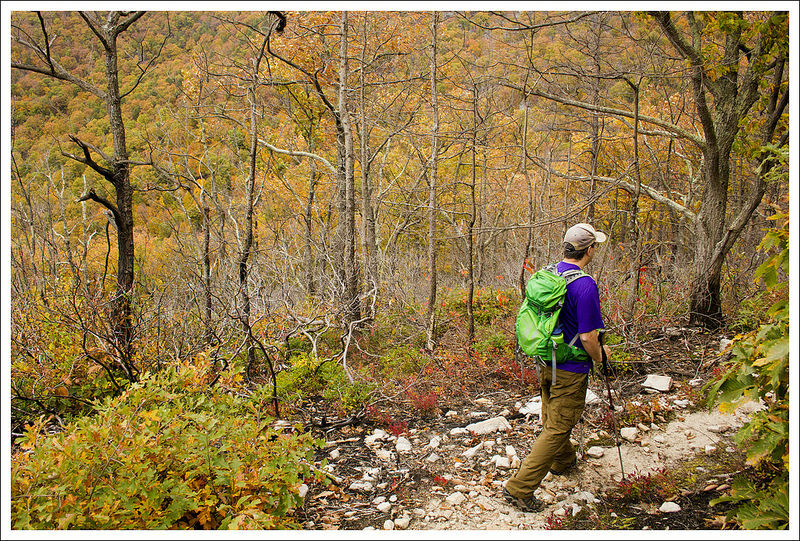 I was checking out this write-up as I plan to hike Veach Gap again soon and noticed the shout-out to me! 🙂 It was great fun meeting you and I’ve been following your hikes ever since. Thanks for this site! Love you guys! Is there still a nice campsite at the overlook? I haven’t been since the fire. Thanks. There is still a place to put a tent. I don’t know if I’d call it nice. Hunters are just hikers with a tasty sideline. I hunt and hike the Massanuttens; both are equally interesting. Interestingly hunters usually move a lot slower so they see things that speed hikers miss. Awesome to see you guys back at it in the Harrisonburg/C’ville area! Thanks for the outstanding info, as always! Yes! Always nice to hike close to home!